This interactive and intensive course is designed for the dentists who wishes to perform his or her endodontic treatments with predictable clinical success, without undue complications. In the extracted molar with the broken instruments, take a small round bur and make a perforation on the pulp floor. The bigger the perforation the harder to repair it. Take x-ray after perforation. Chaniotis Antonis is a graduate of the University of Athens Dental School, Greece (1998). In 2003 he completed the three-year postgraduate program in Endodontics at the University of Athens Dental School. Since 2003, he owns a limited to microscopic Endodontics private practice in Athens, Greece. 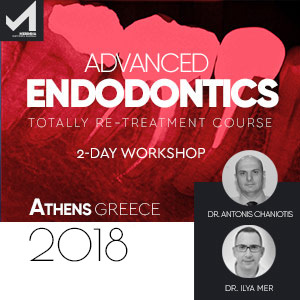 For the last ten years, he served as a clinical instructor affiliated with the undergraduate and postgraduate programs at the University of Athens, Athens Dental School, Endodontic department, Greece. In 2012 he was awarded the title of Clinical fellow teacher at the University of Warwick, Warwick dentistry UK. He lectures extensively nationally and internationally and he has published articles in local and international Journals. He serves as an expert lecturer for various websites of on line dental education. Dr. Chaniotis is passionate about video documentation in microscope enhanced Endodontics and believes in the educational power of video presentations. He currently serves as an active member of the Hellenic Society of Endodontology ( ESE full member society), an active member of the Academy of Microscope Enhanced Dentistry (AMED), a certified member of the European Society of Endodontology (ESE) and an international member of the American Association of Endodontists (AAE). Tver Medical University, Russia Jerusalem Hadassa Dental School, Israel International Program in Endodontics, University of Pennsylvania, USA Practice limited to endodontics, Moscow, Russia Speaker of Quintessence educational center Scientific editor of publishing house Quintessence Russia and Dental Azbuka Head of Quintessence study club in Endodontics.